Saturday night I had one of the most enjoyable nights out in quite some time. 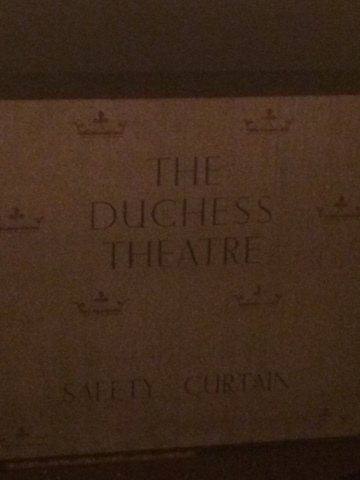 I'm not really someone you would call a theatre aficionado, I've never been a big fan of musicals with all that singing and dancing, but the current show at the Duchess Theatre has made me reconsider how often I visit the theatre. The premise of the show is simple; an Am-Dram group have managed to wangle their way onto a West End stage at which point everything that can go wrong does. But if the premise is simple then the execution is carried out expertly. You could easily ruin an idea such as this with a basic slapstick routine and clowning about. 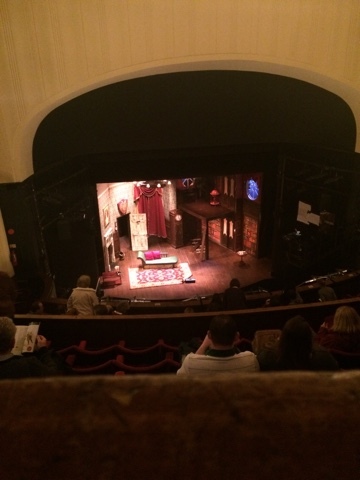 Instead the team at the Mischief Theatre Company bring the good old British farce back to life with a bang, and they have thought of everything. From the comedic take on a theatre programme (only £4) to the atmospheric music as everyone takes their seat anything and everything has been taken into account. Before the play begins the "backstage" team are interacting with the audience, their hunt for Winston getting everyone in the mood for the show ahead. But the highlight of the pre-show entertainment for me was the "director's" meet and greet. Like a headmaster at a school play "Chris Bean" is out there talking to the audience, setting them at ease and introducing himself. You can almost imagine him walking up to someone and saying "ah Mr and Mrs Smith, so good to see you. Bully has been doing very well this year and I expect he will pass his exams with flying colours." I could easily go through the entire play listing every joke but it simply wouldn't do them justice. I think that the highest praise I can pay the jokes is that for days after my family and I have been repeating them to each other and fitting them into every day situations as much as possible. Ledgers and notebooks are particular highlights that stick in my mind, items that you would consider mundane are turned into great sources of hilarity. But the ultimate set piece of the first act is quite possibly the most entertaining sword fight ever seen on a west end stage. Swish, clash and totally implausible special effects bring the house down and everyone is left needing a stiff drink, although I think I'll avoid the whiskey! When the curtain comes down on the first act you are left wondering just how they will manage to top it in the second half. Don't worry, the second half doesn't disappoint. I just said that the first half brings the house down but perhaps I should have saved that metaphor for this half of the show as everything comes tumbling down around our loveable cast of actors who seem so out of their depth. "Trevor" and "Annie" are forced out onto stage, where one takes to it much more enthusiastically than the other, to fill in for members of the cast caught up in accidents. The cast have to improvise and cover for the missing Winston in a series of imaginative scenes before "Sandra" and "Annie" start a rolling fight that would have the WWE proud. These two actresses put on really strong performances as the show draws to a close and everything unravels to a very satisfying conclusion. In all honesty I have not said enough about the cast of this fine performance in my review. Without them this show would fall flat on it's face, and that wouldn't be as funny as the number of times we see the actors do this. Each and every one of them deserves all of the plaudits they receive and the warm round of applause they receive at the end of the show. With the show coming to an end next month I can only hope that Mischief have something planned for this cast as they really are brilliant and it would be a travesty if they just disappeared. And this brings me nicely on to The Comedy About a Bank Robbery, the next production for the team behind The Play That Goes Wrong. 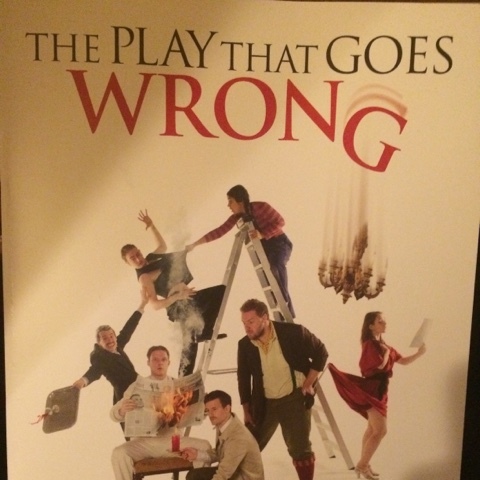 Set to open in the Criterion Theatre in March with the original cast of The Play That Goes Wrong the first 25 shows have all tickets available for £25 and I hope to be able to see this sooner rather than later. If you haven't seen The Play That Goes Wrong then I wholeheartedly recommend that you get over to The Duchess Theatre before the final curtain comes down on this show. Maybe I'll even join you for another trip to Haversham Manor.